This 1 bedroom apartment is located in Bežigrad and sleeps 3 people. It has WiFi, parking nearby and air conditioning. They create a beautiful space with all the modern amenities, creative flourishes throughout, and a sprinkling of magic. Like the gorgeous bathroom, or the custom-made, fully-equipped kitchen. Or a bedroom unlike any you've seen so far. And all of this in Ljubljana, quite probably the greenest, cleanest capital city in the world. Do your really want to miss out on this? The flat (48m2) is located on the 5th floor (no worries, there's an elevator) and it has a beautiful view of the city and the Alps view. 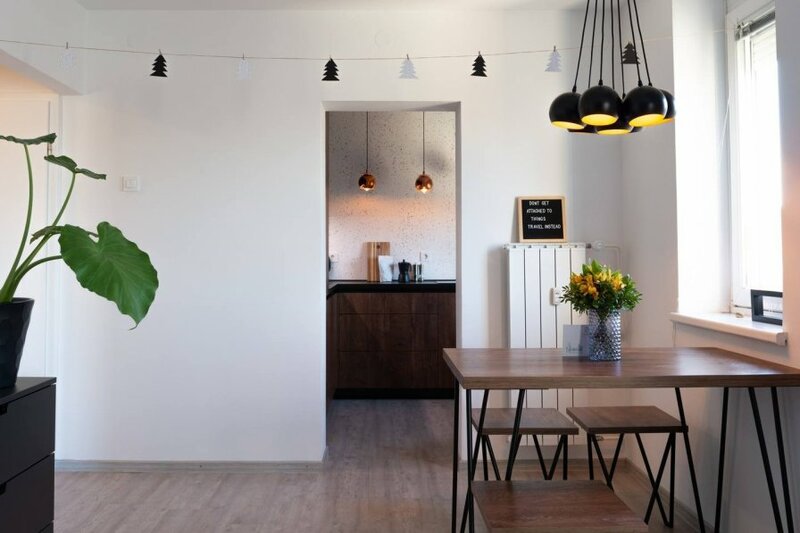 The freshly renovated apartment has everything you'll need to stay comfortably and safely in the heart of Ljubljana. In this bright (with window shades) and minimalist bedroom, with comfortable high quality bed and bedding- you will sleep like a baby. The space is clean and practical, with storage and lots of coat hangers, iron, full-length mirror so you can see how you look from head to toe before heading out to the city. The kitchen is fully equipped (ok, so there's no oven), that even the biggest cooking enthusiast will feel comfortable. you can think of so you can prepare delicious meals just like at home. A large and bright living/dining space with comfortable sofa for a third person, a large flat screen TV with loads of channels and a tiny French balcony to enjoy the view -- the city on the left, and the Alps on the right. Cozy dining area for up to four people, dining set was custome-made and designed in Ljubljana. Tiny, but big-enough-for-two-people-who-get-along-really-well bathroom with comfortable walk-in shower and all possible hair and body care produtcs, from hair dryer to make up remover, pods etc. Everything to get yourself ready for the day of exploring or just for a business meeting downtown. The space is meant for guests to use, so the apartment is yours for the duration of the stay. Bikes are provided on request. Anything you want to know, ask us. We're a little light on historic facts, but we make up for it by knowing everything about what's happening now. Concerts, art shows, shopping, hiking, exhibitions -- tell us what you like and we'll tell you where to find it. The neighbourhood is really nice and is getting very popular in the last few years, its a short walk to the old town, with a few tall, colourful buildings and a lot of green spots to sit down and relax. -10 minutes walk from the Metelkova, the artistic heart of Ljubljana. The apartment it's just a few minutes walk from the main rail station and bus station. There's a city bus stop just across the street.